You’ll need all the gold in Gringott’s to get through the new Harry Potter adventure. 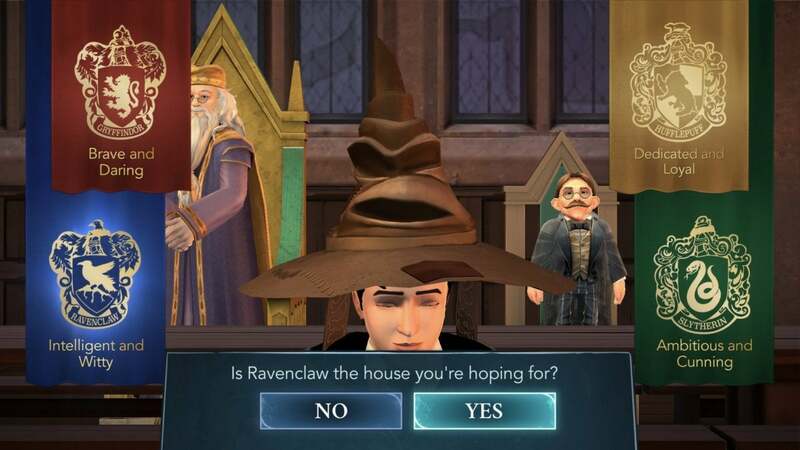 Harry Potter: Hogwarts Mystery for iOS reminds me of my grad school. It’s not just because of the gothic spires or the intellectual combativeness of the students, and it’s not even because our dining hall was modeled on the same Oxford dining hall that served as the Great Hall in the films. No, instead it’s because I’m reminded at every turn that the place wants me to cough up some cash. Developer Portkey’s new game is a free-to-play adventure that Death Eaters would be proud of. It’s free-to-play of the old, money-grubbing variety; the kind that makes you suffer through hours of waiting if you don’t drop five bucks or more to bypass it all. 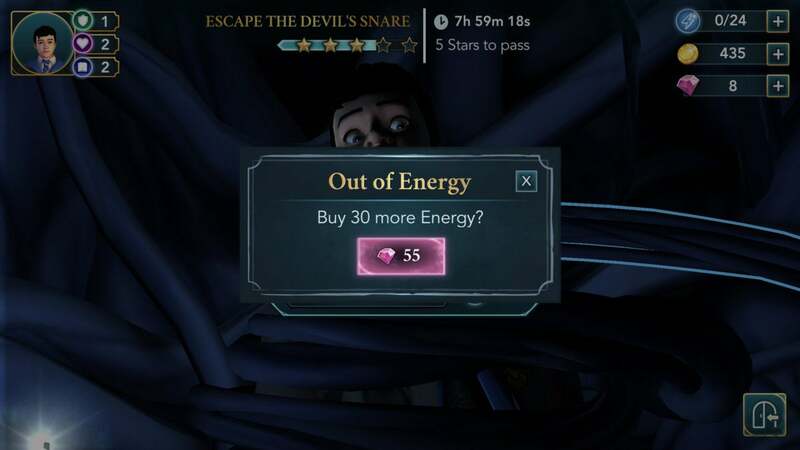 Had I succumbed to Hogwarts Mystery’s every single request for cash to further the adventure, I doubtless would have already spent enough cash to buy a proper blockbuster game like the new God of War for the PS4. Had I played through the upcoming weekend that way, I probably could have spent enough to cover a student loan payment. Get used to seeing this a lot. Also, 55 gems is around $2.00. Not only that, it slams you with these requests repeatedly and quickly. Most of the “gameplay” consists of tapping elements of the screen repeatedly to fill a meter, with each tap using a bit of energy. Around an hour ago I was polishing my Quidditch broom in this way and found my progress shut down again until I could polish it again. I waited. I read a little news. I tinkered with my iPad. Around half an hour later I came back to my phone and tried to work the magic again. I managed to get three more taps before it shut me down again. Worse, each quest like this has a timer on it, which implies you suffer some kind of penalty if you don’t finish in time. Spend some money, though, and your troubles go away. And to think, these types of games are usually aimed at kids. That’s certainly the case here, what with Hogwarts Mystery’s simple language and situations any school kid will relate to, but the constant demands for cash imply the kid in question must be Richie Rich. Maybe the point is to drive home the idea that money is magic in the real world. 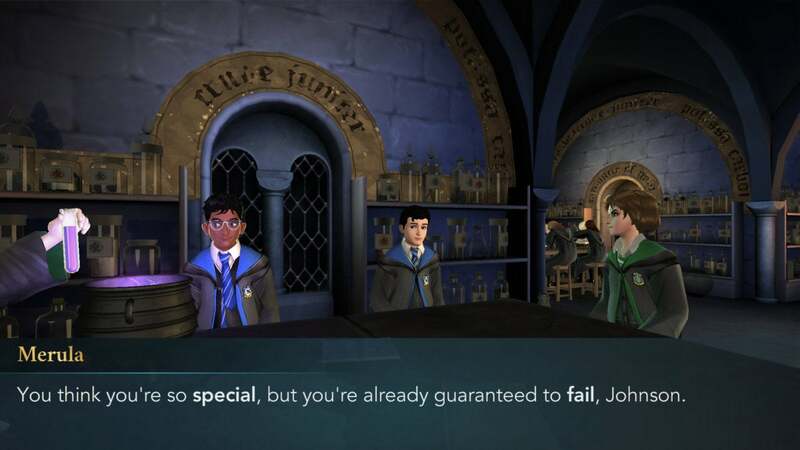 Sometimes Hogwarts Mystery looks like an actual game, but it’s not often. 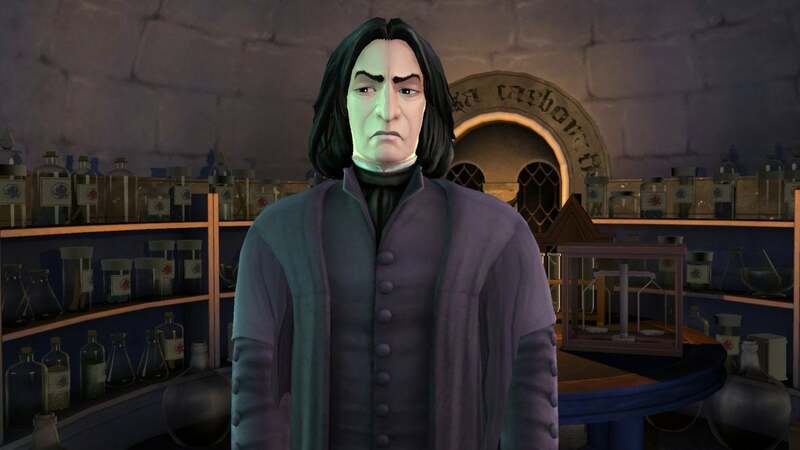 I’ve spent a lot of words on the nasty free-to-play model at the expense of everything else because it’s about as unavoidable as glares from Severus Snape in potions class. It’s a shame, as it’s still possible to find some of the charm and magic of the series here. Actors like Michael Gambon and Maggie Smith return here to voice beloved characters like Albus Dumbledore and Professor McGonagall, and it manages to pack in all the greatest hits from the Whomping Willow to winning points for one of the four houses. It even allows for you to craft your own story to a degree, as most actions award points for courage, empathy, or knowledge, which in turn open certain conversations and actions. Yet on the whole Portkey presents us with a very guided story, specifically one of a new student who’s bullied because his brother disappeared and was apparently a bit of a nuisance. You’ll meet nerdy friends whom you can distract from wizardy marbles by telling them the library burned down, and you’ll trace shapes on your phone to cast some spells You’ll even have to deal with a Malfoy-like character whose heaven apparently involves making your life hell. Still, there’s a clear love for the universe here—even if it feels a bit like fan fiction—and that love reveals itself in details like the house elves and gargoyles you can click on for a tiny bit of extra energy. Man, it really is like graduate school all over again. It sometimes seems as though it’s just for show. The most disappointing thing about Hogwarts Mystery is that it takes the stereotypical (and predatory) design for a free-to-play iOS game and dresses it up familiar and appealing clothes. It’s a bit like a mall Santa who spends the rest of the year in and out of jail. If it’s going to ask for money at every turn, why doesn’t it simply let us pay a one-time fee to unlock everything for good? And for all it does right, missed opportunities show up in the strangest places. After years of viral Sorting Hat quizzes for which Hogwarts house you “belong” to from the likes of Pottermore and BuzzFeed, someone at Portkey apparently thought it was a good idea to let you simply choose whether you want to be a Gryffindor, Ravenclaw, Hufflepuff, or Slytherin. I’d wager that many people would have downloaded it simply to take that quiz if it proved good enough, and so would have dropped some cash on items just for the love of it all. Based on the rest of the game, I half-expected him to ask me to slip him some cash to get that placement. Yet there’s a thread of cynicism that runs throughout Harry Potter: Hogwarts Mystery like a damaged core in one of the series’ finely crafted wands. Someone at the top appears convinced that anyone who plays this game is a sucker who’ll toss away some cash at the just for the pleasure of seeing the words He Who Must Not Be Named flash on the digital screen. And the worst part? It’s apparently true. 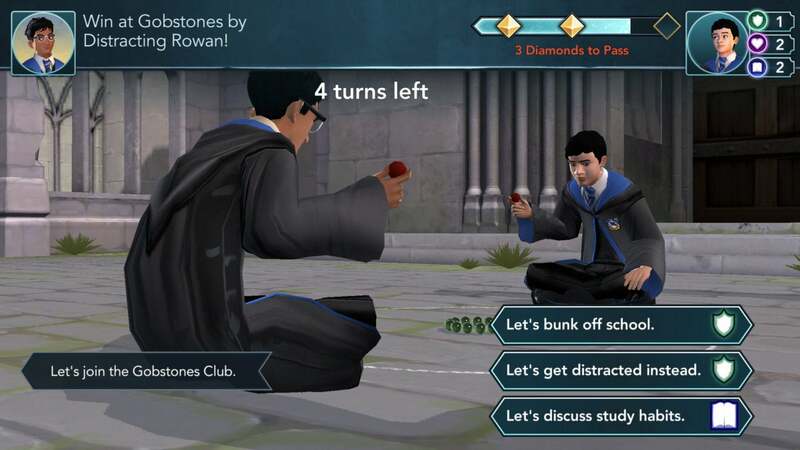 At the time of writing, Hogwarts Mystery is already climbing the charts of the top-grossing apps. Maybe you think I’m exaggerating about all this. Maybe you think I just need to have a little patience. Let’s put it this way: I’ve been trying to finish that broom lesson for the entire time I’ve been writing this article, and it’s still not done. And now it never will be. Expelliarmus.